I don't know how you found us, but I am really glad you did. You are about to enter the world of Environmental Literacy from a person of color's perspective. We like to consider ourselves pioneers in world wide environmental movement, with a mandate to learn first, return to our roots and evaluate how what we have learned fits, and then return to the environmental community itself, to share the kind of adjustments we have discovered needs to be made to their perceived perspectives, so what we are now teaching as a collaborative group, can finally have a real chance to truly become a benefit. This process as far as we are concerned is cutting edge community organizing; using environmental literacy as a means to finally complete the integration process in America. Building A Sustainable Earth Community (BSEC), an organization that was founded in 2007, has now become its own institution for environmental learning. Our initial step was to establish some kind of multicultural coalition that would serve as the foundation for building such a sustainable circumstance. Then from that foundation an environmental conference was born to give people (all people) a place to be heard and respected. 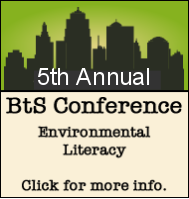 We decided to call that conference, The Breaking The Silence (BTS) conference in Kansas City, Kansas. The first one was held in 2007, and we held our 5th & final one in March of 2012. I can personally say, it was one heck of a learning experience, and as you will see from reviewing our BTS Conference section, each year a tremendous amount of environmental circumstances have been addressed. It's impossible for me to sit here now and tell you the future for BSEC or BTS, but I can say wherever or whatever I find myself doing, I promise Building A Sustainable Earth Community will be my purpose. It is said that everything is connected, and it is my desire in life to prove it. So I hope you enjoy our Website, and once again I would like to say, Welcome! Peace! Click Here To Begin!